June 10, 2008: For more than 400 years, astronomers have studied the sun from afar. Now NASA has decided to go there. "We are going to visit a living, breathing star for the first time," says program scientist Lika Guhathakurta of NASA Headquarters. "This is an unexplored region of the solar system and the possibilities for discovery are off the charts." The name of the mission is Solar Probe+ (pronounced "Solar Probe plus"). It's a heat-resistant spacecraft designed to plunge deep into the sun's atmosphere where it can sample solar wind and magnetism first hand. Launch could happen as early as 2015. By the time the mission ends 7 years later, planners believe Solar Probe+ will solve two great mysteries of astrophysics and make many new discoveries along the way. The probe is still in its early design phase, called "pre-phase A" at NASA headquarters, says Guhathakurta. "We have a lot of work to do, but it's very exciting." At closest approach, Solar Probe+ will be 7 million km or 9 solar radii from the sun. There, the spacecraft's carbon-composite heat shield must withstand temperatures greater than 1400o C and survive blasts of radiation at levels not experienced by any previous spacecraft. Naturally, the probe is solar powered; it will get its electricity from liquid-cooled solar panels that can retract behind the heat-shield when sunlight becomes too intense. From these near distances, the Sun will appear 23 times wider than it does in the skies of Earth. Mystery #1—the corona: If you stuck a thermometer in the surface of the sun, it would read about 6000o C. Intuition says the temperature should drop as you back away; instead, it rises. The sun's outer atmosphere, the corona, registers more than a million degrees Celsius, hundreds of times hotter than the star below. This high temperature remains a mystery more than 60 years after it was first measured. Mystery #2—the solar wind: The sun spews a hot, million mph wind of charged particles throughout the solar system. Planets, comets, asteroids—they all feel it. Curiously, there is no organized wind close to the sun's surface, yet out among the planets there blows a veritable gale. Somewhere in between, some unknown agent gives the solar wind its great velocity. The question is, what? "To solve these mysteries, Solar Probe+ will actually enter the corona," says Guhathakurta. "That's where the action is." 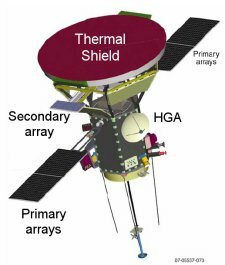 The payload consists mainly of instruments designed to sense the environment right around the spacecraft—e.g., a magnetometer, a plasma wave sensor, a dust detector, electron and ion analyzers and so on. "In-situ measurements will tell us what we need to know to unravel the physics of coronal heating and solar wind acceleration," she says. Solar Probe+'s lone remote sensing instrument is the Hemispheric Imager. 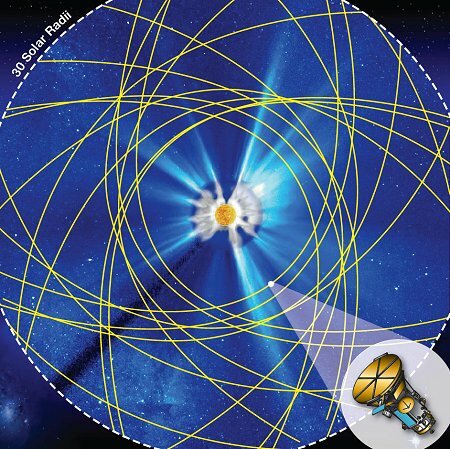 The "HI" for short is a telescope that will make 3D images of the sun's corona similar to medical CAT scans. The technique, called coronal tomography, is a fundamentally new approach to solar imaging and is only possible because the photography is performed from a moving platform close to the sun, flying through coronal clouds and streamers and imaging them as it flies by and through them. With a likely launch in May 2015, Solar Probe+ will begin its prime mission near the end of Solar Cycle 24 and finish near the predicted maximum of Solar Cycle 25 in 2022. This would allow the spacecraft to sample the corona and solar wind at many different phases of the solar cycle. 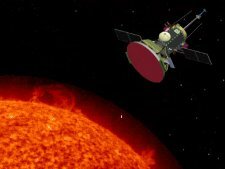 It also guarantees that Solar Probe+ will experience a good number of solar storms near the end of its mission. While perilous, this is according to plan: Researchers suspect that many of the most dangerous particles produced by solar storms are energized in the corona—just where Solar Probe+ will be. Solar Probe+ may be able to observe the process in action and show researchers how to forecast Solar Energetic Particle (SEP) events that threaten the health and safety of astronauts. Solar Probe+'s repeated plunges into the corona will be accomplished by means of Venus flybys. The spacecraft will swing by Venus seven times in six years to bend the probe’s trajectory deeper and deeper into the sun’s atmosphere. Bonus: Although Venus is not a primary target of the mission, astronomers may learn new things about the planet when the heavily-instrumented probe swings by. "Solar Probe+ is an extraordinary mission of exploration, discovery and deep understanding," says Guhathakurta. "We can't wait to get started."